In this section we look at the different types of lawn mowers. In our what is a mower ? article we provided you with an overview of what is a mower and their utilities while describing you some types of lawn mowers. Here we go more in depth with more useful information appropriate for any type of users. 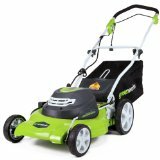 In this category we review all types of lawn mowers used and needed by an average individual. This sections covers the type of mowers you would need for your residential backyard , small garden, etc, something to keep you lawn nit. We give you here tips regarding the selection of a useful mowers appropriate for your back yard. In our commercial section, we will review all types of lawn mowers used and needed by professionals landscapers or anyone looking to start a landscaping business. We cover the types of mowers a professional would need to provide a quality work, take care of large surface lawns and what to bare in mind while operating them. Mainly for those starting a landscaping business, this section will provide you with selected and cost effective mowers to take in mind while embarking in your new business. This will also provide professional with new technologies advancement in the industry and what to consider while looking to upgrade your current lawn mower . We will review the following type of mowers adequate for a commercial purpose. In case we have left out a type that you wish us to review and provide you with more insights, leave us a comment below and we will make sure to review it for you.